MORE Humanistic Methodology was created to contribute to the evolution of humanity, in a pragmatic manner, through the personal development of each human being, so that each one can shine. 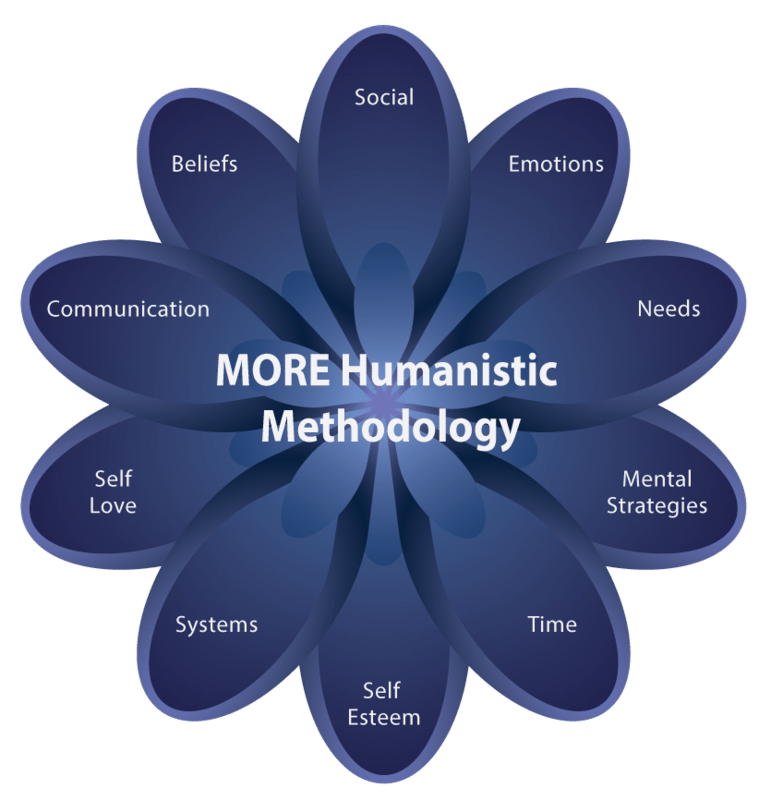 Clients and professionals consider the MORE Humanistic Methodology a leading edge methodology, extremely efficient, distinct and with extraordinary results. The professionals tell us that they have a competitive edge with MHM, value added, results they never dreamed possible and that they are more confident in conducting the process with the client/patient. Professionals and clients feel confident and motivated due to the fact that MORE Humanistic Methodology is a living methodology, based on proven science, and its creators promote its constant evolution. Why Do Professionals Become Certified in MHM? 1 Because they verify that they obtain extraordinary immediate results in the process with the client. 2 Because the Client corroborates the effectiveness of MHM, the lasting results in all areas of their life (work, career, relationships, health, social contribution, mission, spiritual), and the inner awakening of his or her potential. 3 Because they hold in their hands a methodology with practical techniques, models and powerful concepts. 4 Because they share the status of contributing to a new generation in the transformational work of human being. 5 Because the client notes profound transformations overall, in a generative process, in their emotional, mental, physical and spiritual dimensions. 6 Because they become capable of guiding a client in a personalised process. 7 Because they go beyond what they imagined possible. 8 Because they are internationally certified by IHCOS®. MHM was developed by Karina M. Kimmig and Fridolin L. Kimmig, who are also the founders of MORE Institute. With a long experience working with people in coaching, and as trainers in different areas of personal development, they built concepts, techniques and methods for a more profound and generative work in the intervention with the client. The MHM has a practical approach, in which the professional has a set of techniques, structures of sessions, learning pillars to understand and work the human being in his individuality, as shown in the Graphic. In Coaching there are enormous differences in methodology, performance, quality and results. Mastering is an expression for wisdom, skill, and is the result of permanent personal development. With its methods and tools, a Coach with Humanistic Certification can operate profound changes, that others cannot even dream of. I love to decipher the mental strategies of human beings. Understanding the unconscious mind and using it as leverage for transformation. Challenges are part of growth. Change, even the most difficult, with empathy, love and humour is marvellous! Curious? Learn more about me here.. I like to look at the true essence within each human being. I believe that emotions are the path to change. Don’t wait to change. I know that time does not stop, and you do not know how much time life will give you. Curious? Learn more about me here..